Even though progress has been made over the last several decades in reducing mortality rates worldwide, more than 300,000 mothers die each year from causes related to pregnancy and child birth. This leaves children more vulnerable to risks of exploitation and violence. Since 1990, deaths of children under age 5 worldwide have been cut in half — and maternal deaths have decreased by nearly as much. This is one of the greatest success stories in international development in the last 25 years. Progress has largely been achieved with proven, inexpensive interventions that address the leading causes of death, including diarrhea, pneumonia, malnutrition, and complications during pregnancy and birth. 830 mothers die each day in pregnancy and childbirth, often leaving children orphaned, vulnerable, and impacting the family’s long term economic outlook. 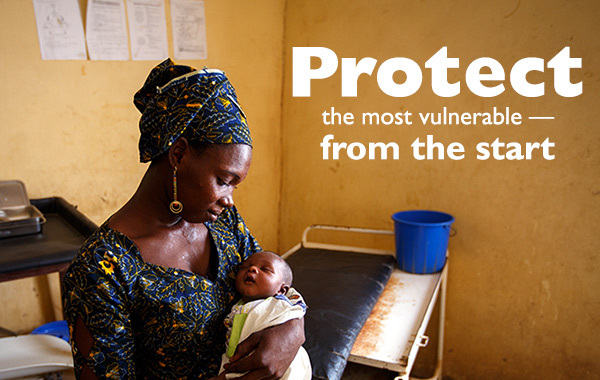 15,000 children die every day, mostly from preventable and treatable causes such as pneumonia, diarrhea, and malaria. 2.7 million newborns around the world die each year — about 1 million on their very first day of life. One billion – half the world’s children – are victims of violence and exploitation. The Reach Every Mother and Child Act (S. 1730, H.R. 4022) will help implement a more efficient, sustainable approach for saving the lives of moms and children. In turn, more children will be granted environments where they are protected, where families have a greater chance of being lifted out of poverty, and where they can live a childhood free from exploitation and violence. The Reach Act has recently been introduced in the Senate and the House! Ask your members of Congress to co-sponsor this critical bill. Learn more about the Reach Act. Related stories from the blog.